As RBGE continues to develop scientific work in Colombia, regarded as the second most diverse country on Earth, we are celebrating this work through a series of ethnobotanical workshops and events, exploring and celebrating the cultural relationships between plants and people. This workshop is part of this exciting programme and will allow students to gain a comprehensive understanding of why RBGE’s work here is so important, and what makes Colombia so special. Students will then have the opportunity to experience some South American culture with an exploration into the drumming culture– an important and vibrant part of Colombian life. The morning will be spent learning about Colombia, the sacred and celebratory use of the drum, and learning about the cultural association with the Ceiba tree. 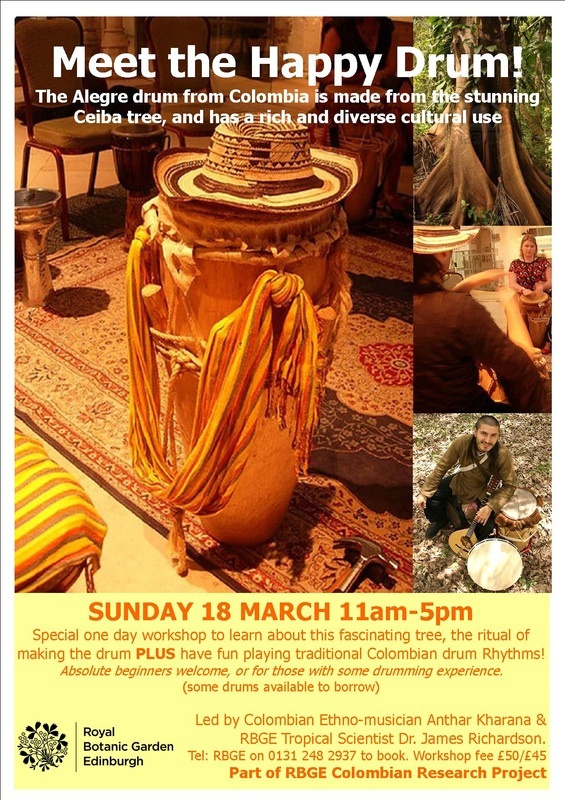 In the afternoon you will have fun learning some traditional Colombian group drumming patterns (suitable for beginners or those with some experience) and playing these together. Djembe drum if you have one. If you don’t have your own drum, please contact us to reserve one.